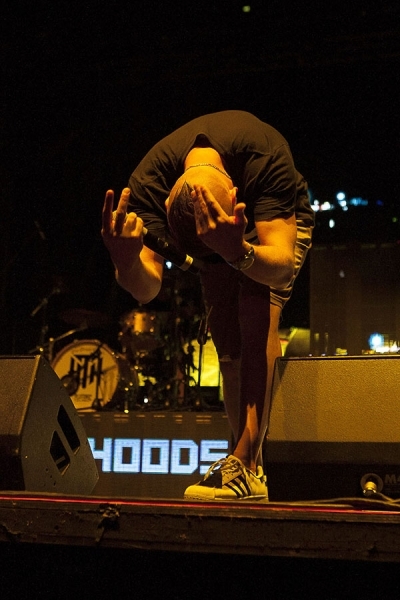 The Hilltop Hoods land their fifth No.1 Album in Australia this week, as their collection of songs from their last two albums now with The Adelaide Symphony Orchestra entitled “Drinking from the Sun, Walking Under Stars Restrung” enters at the top of the ARIA Albums Chart this week. “Drinking…, Walking…, Restrung” becomes the 756th No.1 Albums in Australia (1965 to 2016) and the 607th for ARIA (1983 to 2016), plus the 402nd to debut at No.1 and the third by an Australian act this year. It’s also the fifth No.1 for the group and the fourth on the own record label ‘Golden Era’. The band’s first set to hit the top was “The Hard Road” (on Obese Records) when they debuted at the top on the 10th of April in 2006, staying there for a single week, then their next three albums also debuted at the top spending two weeks each at the summit, “State of the Art” (22nd June, 2009), “Drinking from the Sun” (19th March, 2012) and their last wet “Walking Under Stars” (18th August, 2014, TW-56). The band have now accumulated eight weeks at the top from their five No.1 albums, and they also are now equal fifteenth on the list ‘Accumulated No.1 Albums’ alongside other local acts such as Silverchair, Crowded House, Powderfinger, and AC/DC who have also cracked five No.1 gongs in the past, plus for this decade they have now spent five weeks at the top moving them from equal eleventh to equal eighth (alongside Lady Gaga) on this 2010’s Accumulated Weeks at No.1: Albums; 2010’s’ list. This is also the second restrung album for the group, as their “Hard Road: Restrung” album made it to No.8 in mid-May of 2007, but this is the first time that the word has appeared in a No.1 album title, with the other words in the new No.1 title having already been at the top in June 2009 and March 2012. “Drinking…, Walking…, Restrung” also becomes the 193rd No.1 album by an Australian act to hit the No.1 spot and the 353rd by a group to reach the top here. After two weeks at the top, the “Molly” TV Soundtrack is back down to No.2 and also dropping a place to its lowest position so far of No.3 is “25” by Adele, which late last weeks she won four Brit Awards for, so it could climb back up next week. Rebounding four places to No.4 is Sia with “This is Acting” and down two to No.5 is “Nothing Has Changed: The Best of” for David Bowie, whilst his studio album “Blackstar” is back up two places to No.7 this week. Down one place each are Justin Bieber with “Purpose” and Coldplay with their seventh album “A Head Full of Dreams” to No.6 and No.8 respectively, whilst returning to the Top 10 at No.10 is the Grammy winner for ‘Album of the Year”, “1989” by Taylor Swift. The second and final Top 10 entry for this week is the debut set from English artist Jack Garratt entitled “Phase” which comes in at No.9 this week, entering at No.3 in his home country last week. UP: After returning to the chart last week at No.37, the Rod Stewart compilation “Some Guys Have All the Luck” leaps up twenty-three spots this week to a new peak of No.14, whilst the 1977 Fleetwood Mac classic No.1 album “Rumours” rebounds forty places to land at No.22 this week. The current No.15 single for Selena Gomez “Hands to Myself” (HP-13) helps her album “Revival” to rebound forty-nine places to No.24 and the Sia fest continues over on the albums chart, as her previous album “1000 Forms of Fear” is back up twenty-three spots to No.25 (she was on Graham Norton last week here in Oz). The “Best of Bowie” compilation is back up eight to No.38 and the current tour for Tina Arena sees her “Eleven” set jump back up twenty-nine places to land at No.40 this week. Last weeks debut for Nicole Car entitled “The Kiss” bullets thirty-two places this week to No.42 and another classic album in “Nevermind” by Nirvana is back up twenty-one places to No.44, whilst another tourist in Rob Thomas sees his “The Greatest Unknown” set leap forty-three spots to No.48 this week. DOWN: Three albums leave the Top 10 from last week, firstly is Rufus who are down one to No.11 with “Bloom” (HP-1×1, WI10-4) which lasted within the ten as long as their debut set “Atlas” (four weeks also). Last weeks two Top 10 debuts both tumble out this week, with The Jezabels down nineteen spots to No.23 with “Synthia” (HP-4) and Ronan Keating drops twenty-one to No.27 with “Time of My Life” (HP-6). The “Deadpool” soundtrack drops down eleven to No.29, but could rebound next week as the physical CD is out now as of Friday, after which the “Straight Outta Compton” soundtrack is down nine to No.31. “Like a Version Vol.11” and the James Bay album “Chaos & the Calm” both drop thirteen places each to No.34 and No.36 respectively, whilst dropping ten to No.37 is Sam Smith with “In the Lonely Hour”. One Direction might be climbing the singles chart at the moment, but their album “Made in the A.M.” is down thirteen spots to No.39 this week and Brit Award winners Tame Impala (Best International Group) see their “Currents” album drops fifteen to No.41 here. After climbing last week to No.32, the Skyhooks compilation “Hits’N’Riffs” drops back down thirteen to No.45 and another album falling thirteen places is Meaghan Trainor with “Title” to No.47, whilst falling hard are the self-titled album for Adam Brand & The Outlaws (28 to 49) and “If I Can Dream” for Elvis Presley (25 to 50). Falling into the lower fifty this week is Panic! At the Disco (40 to 53), The Eagles “Selected Works” (39 to 55), Ellie Goulding (38 to 59), Courtney Barnett (36 to 60), Megadeth (50 to 62), Jess & Matt (47 to 69), Lucinda Williams (43 to 72), Elton John’s new album (31 to 73) and Boy & Bear (42 to 76). Debuting just outside of the Top 10 at No.12 is Simple Plan with their fifth studio album “Taking One for the Team”, which is their seventh album to chart in Australia (5 studios, one live and one remixed set), and their first entry since their re-packaged fourth album “Get Your Heart On–The Second Coming” (HP-53, Dec 2013) and this set debuts one place higher than the first version of “Get Your Heart On” did in late June of 2011 (HP-13), plus if this album doesn’t go any higher, it becomes the bands second highest charting album here, as they’ve had two No.6 album so far in “Still Not Getting Any” (Nov 2004 LP#2, peaked Feb 2005) and their self-titled album from this week in 2008 (LP#3). The third album for Australian hard-rock act Wolfmother debuts at No.17 entitled “Victorious”, plus its their first albums chart entry this decade, as their first two albums were both issued in the first decade of the century, with their self-titled debut album coming out in November 2005 and their second set “Cosmic Egg” out in early November of 2009; both albums debuting and peaking at No.3 too. Another act who we haven’t seen on the charts for awhile are The Corrs, who debut at No.18 with their sixth studio album “White Light”, which is also their first new studio album and entry in over ten years, as their last entry was back in late October of 2005 with “Home” (HP-44). Lower 50: The Prince tour of Australia is helping his collection “The Very Best of” to climb up eight to No.51, whilst the “Greatest Hits” for Fleetwood Mac are back up eleven spots to No.61 and another tourist in Simply Red are up fourteen places to a new peak of No.62 with “Big Love: Greatest Hits 30th Ann.Ed.”. The re-entries for this week are led by Michael Jackson with “The Essential” at No.74, followed by Elton John’s classic album “Goodbye Yellow Brick Road” at No.78, G.H.’s for both Queen and Neil Diamond at No.79 and No.80 respectively, the self-titled Rage Against the Machine is back in at No.81. Kendrick Lamar is back in at No.87 with his former album “Good Kid, M.A.A.D. City” and right behind at No.88 is Foals with “What Went Down”, with the final returnee being Paul Simon and his 1987 set “Graceland” at No.90. The first of three new entries in the lower fifty is new at No.77, the thirteenth studio album for Mavis Staples entitled “Livin’ on a High Note”, which becomes her first chart entry here in Australia. US progressive metal act After the Burial also see their first entry here with their fifth album entitled “Dig Deep” which is new at No.91 this week, with the final entry coming in at #100, “Painting with…”, the tenth studio album for the group Animal Collective, and their third to chart here, plus it features the current single “FloriDada”.